Home>Resources>SEO Tips>How To Create SEO Friendly Content By Using SEMrush? How To Create SEO Friendly Content By Using SEMrush? SEO writing assistant is an advantageous and needy feature on SEMrush. It helps you to write the SEO friendly content that can beat your competitors. Before we go in deep would like to say that if you are unknown to SEMrush, you can read our “What is SEMrush and how to use SEMrush” article. It will help you to make a clear idea on SEMrush. Let us come back to the topic. In the world of internet content is king. No matter what business you do on the internet, you need to focus on content creation related to your business. It’s not just enough to write your product details or service details on your portal. You need to create some engaging contents which perfectly represents you. The more quality content you write, people get more attracted to your services. But writing quality content which can attract visitors is not simple. At online it is more difficult to write content because here you not only have to write something attractive but also which can compete with your rivals. Now the internet has lots of opportunities. But besides that, the competition is also very high. Here we need to the contents which are SEO optimized. Optimized contents are one of the ranking factors that Google rank improves. As because the competitions challenge for the content marketers getting big. Keeping on mind the race we need some special tools to write SEO friendly contents. To solve the problems and to make the job easier SEMrush has a SEMrush content writing tool. Here you will find all the essential things from finding target keywords to write complete readability contents. A comprehensive content marketing toolkit is present here. 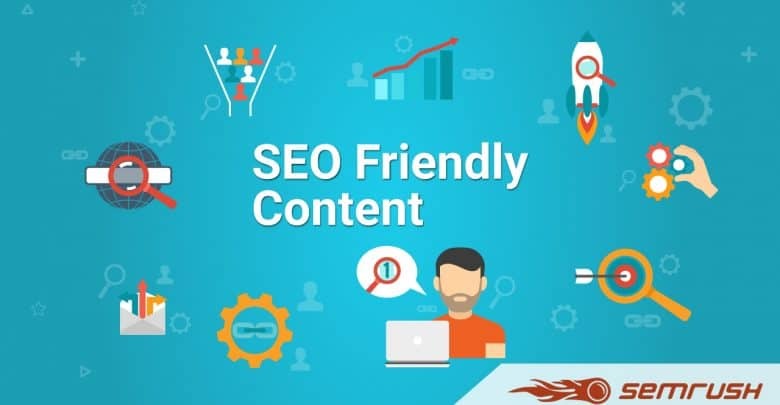 In this article, we are going to tell, How to Create SEO Friendly Content by using SEMrush?. Let’s get started. For all content writers, it is essential to choose the correct topic. Here we used the ‘correct topic” term because there are lots of topics might be available related to you. But, those topics might not give you the optimum level of result. Choosing the topics which attracts more visitors, which are on trending is reasonable. Choosing the right topic is very easy to do in SEMrush. To do so, you need to go on the topic research. After clicking there, you will see the dashboard where you can enter your wished phrase. SEMrush will show you related to your phrase which topics are most searched on the internet. They show the search volumes according to various categories like google search, Social media, search engines, digital marketing and many other important. From there you can choose your preferred category which you want to target. Another exciting thing is you can select the location. That means you can get the results according to the location if you’re going to focus a specific visitors from a particular locality. After choosing the topic, you need to go on SEO content template. There when you go to view SEO template, you will see the SEMrush tool presented top 10 rivals who already written on your topic. They give a list of keywords, backlinks they are using, their average readability score, text length, what page title they are using and many other essential things. They give the content list of your top 10 rivals. There you can read their content to get the idea of why they are on the top. After gathering all the details now, you can go to the final step. The SEO writing assistant is a perfect tool for content creators to write search engine friendly content. There you need to focus on the SEO rules to write contents. You need to attend your title tags, meta description and to the main content. On the page, you will check the live status of your content while you write. They will suggest the list of keywords which you should implement on the content to get high. They show the readily score of your content, count the words and gives you an overall score on the content you write. The tool is very useful and easy to use. Hope you have got an idea on How to Create SEO Friendly Content by using SEMrush? Thank you for reading. If you have any suggestions, please comment below.